The old dread isn't coming back. You remember it, don't you? The shock of terror when you stumbled in on a zombie chomping on a corpse in the first Resident Evil. Or when the undead dogs jumped through the window? Those are signature moments—along with the compulsive hoarding of typewriter ribbon—that anyone who's played the classic survival horror game will remember. The question Resident Evil 6 faces, then, is whether it can create new shivers or replace that terror with something else as memorable. Despite delivering a game with three campaigns and a load of online features, the answer is clear that this new Resident Evil lacks the wherewithal to either scare you or impress you. My love for the old Resident Evil titles came from those games feeling like self-contained incidents of horror. Somewhere along the line, the series' custodians got more concerned with connecting the games' plots in a labyrinthine continuity than in growing new gameplay ideas. Resident Evil 6 reverses that trend. This outing feels like it's trying to please several different sorts of gamer and draws from the series' own glory days and titles created in the West to do so. WHY: The interesting changes in this Resident Evil can't save it from feeling bloated and boring. Type of game: Dramatic horror—that's what Capcom's calling it, anyway—third-person action game. What I played: Finished three main campaigns and an unlockable one over the course of about 30 hours. Sampled the offline Mercenaries Mode, co-op campaign and Agent Hunt. Resident Evil 6 sports clever enemy design that always forced me to switch up tactics. I wasn't scared very much, but I was grossed out a lot by the wretched looks and squelchy sounds of the rotten-flesh antagonists. Checkpoints that don't save, throwing me back at least an hour. This happened to me twice. Doing the whole "kill the boss, he comes back… again and again" thing once is bad enough. Two times? Three times? Unacceptable. The weight of the exertion put into Resident Evil 6 is palpable. It holds three storylines that each follow a pair of characters as a bioterrorism plague unleashes monstrosities of all sizes throughout the United States and China. (There's also an unlockable fourth campaign.) Each thread has crossover junctions where people can jump into other folks' games. RE6 also has the most robust multiplayer options in series history. The adventures of Chris Redfield and Piers Navins, Sherry Birkin and Jake Mueller or Leon Kennedy and Helena Harper all carry slightly different flavors, each one seemingly designed to speak to different tastes. But that's where many of the problems lie. The all-out effort to throw as many new enemy types, plot twists and set-piece wow-moments into the game comes across as desperate and undisciplined. This installment of Resident Evil feels bloated and every interesting idea that pops up drowns in either its own repetition or in the metric ton of drudgery surrounding it. When I first started encountering RE6's new tweaks , I thought they'd make the awkward tone-deafness of the plot and dialogue bearable. I liked the Combat Gauge, a stamina meter that depletes as you use hand-to-hand combat. Use it too much and you'll eventually be forced to draw your weapons to kill enemies. That balancing act throws players back into the resource management that is a hallmark of Resident Evil. Quick Shot is another step forward that addresses complaints about the lugubrious nature of Resident Evil games' controls. It's a stronger, faster attack that spins you around to blast immediate threats, but it also drains a section off your Combat Gauge. Some enemies will change shape depending on where you shoot them. Blast an arm on a J'avo soldier and it'll transmogrify into a swollen, whip-like bludgeon. Or maybe a shield. Weird human-animal hybrids—like man-spiders and upside-down moth-thugs—sprout from human skin after taking damage in RE6. Each type requires a change in strategy to best deal with them. Playing as the sidekicks offers even more variation to the experience. Their attacks differ from the main heroes in complimentary ways. Jake's chaperone Sherry, for example, wields a stun baton that lets her smack up enemies with any drain on her combat gauge stamina. The electrified truncheon also kills off enemies without the need for an additional—and time-consuming—finishing stomp. Piers' sniper proficiency lets you handle ranged threats while Chris eliminates enemies up close. The enemy design branches along several different trains of thought, too. Zombies in Leon's campaign are closest to traditional undead shamblers. Chris and Piers fight J'avo who are just as nimble and combat-skilled as they are. Jake and Sherry run through extended chase scenes with a Nemesis-like beast on their trail. Variations on just about every sort of enemy that's been in an RE game show up here. You'll encounter zombies that run, throw projectiles or spit acid. They also shoot machine guns at you, dodge and pounce, too. Some mutate when wounded, others shamble towards you with explosives making it necessary to shoot them from afar. 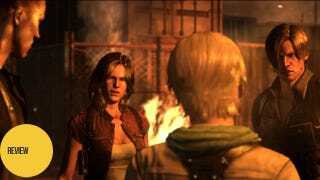 The C-Virus at the root of the game's bioterrorism spits out many mutations of enemy and part of the scant amount of fun in RE6 is in seeing what happens when you shoot a bad guy. Resident Evil 6 comes across as a conscious effort to grow the palette—and hopefully, the appeal—of Capcom's long-running series. Different UI skins, different musical motifs, different weapons and different clichéd attitudes all show up in the game. RE6 isn't quite a set of triplets, though. It's more like one lifeform with three heads. And the problems some have had with RE over the last few games persist with this installment. The palette that the dev team is trying to expand feels stubbornly inbred and obsessive, filled with boilerplate conspiracies uncovered by characters who are walking clichés. So, no, this installment isn't a giant leap in storytelling acumen. All the campaigns criss-cross over each other and it's neat getting three, sometimes four points-of-view of a critical moment in the game. Leon's campaign feels purposefully throwback; it's more moody horror-focused, at first. Chris's missions are more gung-ho action affairs—with vehicular combat—that feel like military squad-based brofests like Gears of War. Jake runs through one, long cat-&-mouse chase as he tries to escape a near unkillable enemy. His levels offer up some martial-arts hand-to-hand brawls amongst all the shooting action, too. The extra unlockable campaign goes the stealth route, in what's probably the biggest departure from the other story options. The intersection gimmick is a great narrative trick wasted on a terrible story. The interwoven nature of the campaigns also serves to highlight how similar everything feels. In Leon's campaign, it feels at first that each body you stumble over is a corpse that could re-animate and attack you. Chris' angst over soldiers dying under his command and Jake's wise-cracking acrobatics start off feeling like they hold different possibilities but all of the campaigns devolve into a dull room-clearing, door-opening, boss-fighting cycle of boredom. There is an unforgivable amount of quick-time events in Resident Evil 6. Those prompt-driven button presses and other context-sensitive actions make it hard to ever feel a sense of flow in the game. The constant pop-ups to press a button to open a door or vault up to a ledge broke any kind of immersion I might have felt while playing. Even worse, the cover system here is awful and made me resort to a run-and-gun style more than I would have liked. Moment to moment, you can lose yourself in the mindlessness of Resident Evil 6. But you'll need to hurdle some poor feedback and dumb design decisions to do so. There's no denying that the party-crashing Agent Hunt is fun and that online co-op makes things a bit less bland when you're playing with a friend. But overall, it's bloated and a mish-mash of cribbed ideas. None of it musters any passion. Mutation gets a bad rap. It's a necessary part of evolving into a newer, more capable lifeform. Without mutation , human beings wouldn't have opposable thumbs, for example. But mutation can also twist organisms into horribly gross or not terribly useful shapes. Unfortunately, It's clear that what's happened with the Resident Evil franchise. Every intriguing design possibility in the game—the way it shifts to stealth, hand-to-hand combat or environmental puzzles—is something cribbed off of a better implementation elsewhere. Resident Evil 6 feels like a ton of gene-splicing has been happening in Capcom's dev studios and the result isn't a miracle cure for what ails the franchise. Instead, it's a misshapen hunchback filled with bad DNA. You could try killing it with fire, but it will probably come back.